I was contacted recently by a supporter of the Nestlé boycott whose nephew questioned her concerns by referring to a blog post on Nestlé’s website. The staggeringly dishonest nature of Nestlé’s presentation of the facts shows how desperate it is to undermine support for the boycott. In a recent survey, Nestlé was voted the least ethical company of the last 25 years. (Order one of our new Nestlé-Free Zone t-shirts to support the boycott). Nestlé, the company with the largest share of the baby milk market (29%), is the target of a boycott because it systematically violates the International Code of Marketing of Breastmilk Substitutes and subsequent, relevant Resolutions of the World Health Assembly. Nestlé executives have rejected Baby Milk Action’s four-point plan aimed at saving infant lives and ultimately ending the boycott. As a result of our inclusion in the responsible investment index FTSE4Good in 2011, the United Reformed Churches ended their support for the boycott. A number of other significant stakeholders had already ended their support for it, including the General Synod of the Church of England, the Royal College of Midwives, and the Methodist Ethical Investment Committee. People who want to work with Nestlé, accept offers of sponsorship or feel good about eating Nestlé products may well be satisfied with these assurances and not want to know whether they are true or not. But the fact is, none of these groups have said the concerns about Nestlé’s marketing of breastmilk substitutes are over. Some have published their own evidence of “systematic violations” by Nestlé and other companies, accusing them of “thereby jeopardising the lives of infants”. Not all have ended their support for the boycott. 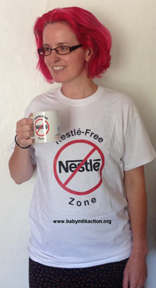 Some have decided to try other methods to put pressure on Nestlé, while commending Baby Milk Action for our work. For those who do want to know the truth, read on. You will find links to source documents so you don’t just have to take our word for it. Our analysis of Nestlé full response to concerns about its marketing practices can be found here. In this blog I will be looking at the misleading claims regarding the position of the United Reformed Church, the Church of England, the Royal College of Midwives and the Methodist Church. Nestlé was included in the FTSE4Good Index not because it changed its marketing policies and practices, but because the FTSE4Good Breastmilk Substitutes Criteria were weakened in 2010. IBFAN finds this unconvincing. We have been in ongoing written communication with Nestlé’s Chairman and Chief Executive for decades. They have demonstrated their unwillingness to change policies and practices. Changes that have been made have come from pressure through regulations, campaigns and the boycott. Faced with the same intransigence, FTSE decided to back down rather than defend the international minimum standards that Nestlé should follow. This has had devastating consequences for child rights as described below. Prior to this, Nestlé said it would not advertise milks for older babies that had the same brand as the infant formula for use from birth. This cross-promotional strategy is documented by IBFAN in its monitoring reports with reference to Nestlé’s own materials. An example from Armenia, a country Nestlé describes itself as “high risk”, is given below. 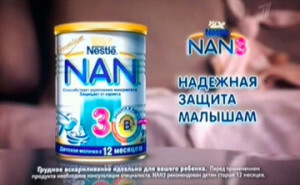 Nestlé promotes it Nan brand with the claim: “reliable protection for children”. …the United Reformed Churches ended their support for the boycott. Although we have publicised these details, we wonder how many URC members are aware that their Mission Committee instructed the boycott to be called off because it felt the Mission Council was duty bound to act on a resolution, even though it had been superseded by events. I am certain it was not the intention of the 2010 Assembly Resolution to reward Nestlé for weakening its formula advertising policy by calling off the boycott, but that is what happened. Again, the reality of what happened is far different from the impression Nestlé wishes to create. Far from finding Nestlé marketing malpractice had stopped, the Church of England arranged its own investigation independently of Baby Milk Action and found Nestlé “systematically” violates the marketing requirements. So how did the Synod end up calling off its support for the boycott? The Church’s governing body, the Synod, first gave its support to the boycott in 1991. Then there was a move to disinvest from Nestlé at the 1994 Synod. Nestlé lobbied extremely hard against this initiative and the Synod decided to suspend its support for the boycott and conduct its own investigation. It formed the Interagency Group on Breastfeeding Monitoring (IGBM) with other church groups, development organisations and academics. Baby Milk Action and IBFAN were purposely excluded. The Cracking the Code report was published in 1997 after monitoring was conducted in Bangladesh, Poland, South Africa and Thailand. This found “systematic violations” by Nestlé and other companies. The Synod accepted the report, but did not support resuming its boycott and disinvesting, partly because Nestlé was not the only company implicated and partly because the Church Commissioners proposed using their supposed influence as shareholders to exert pressure on Nestlé. We have asked the Church Commissioners over the years for information on any success from this approach as we continue to find Nestlé only responds to campaign pressure and enforced regulations. The Commissioners have never reported any impact to us. This is one of the facts Nestlé wants people to forget in its presentation of the history. Note, evidence today shows these practices continue in many countries that do not have effective regulation. They are now evident in the UK since Nestlé took over the SMA brand and has recruited a network of clinical representatives whose job description is to violate the Code by targeting health workers to gain “brand endorsement”. Nestlé led a concerted attack on the Cracking the Code report, even though it had been invited to comment on the protocol beforehand and had declined to do so. A peer reviewed paper based on the research was published in the British Medical Journal in 1998. UNICEF wrote to Nestlé’s then Chief Executive Officer (now Chairman), Peter Brabeck-Letmathé, defending Cracking the Code as supporting its own findings and set out several areas where Nestlé policies needed to change (it took years of campaigning to pressure Nestlé to change its policy on complementary foods, criticised in the UNICEF letter – see boycott successes). Many midwives expected the RCM Council to stop taking money from the companies named in the report. Instead the Council opted to drop the Nestlé boycott, continue to accept funds and to work from “the inside”. Again, Nestlé falsely implies this decision was based on Nestlé having been cleared. Nearly two decades later, the RCM has finally stopped accepting formula advertising for its journal and sponsorship from manufacturers of breastmilk substitutes for events and its conference. …and the Methodist Ethical Investment Committee. As mentioned above the Methodist Conference in 2015 accepted a report from the Joint Advisory Committee on the Ethics in Investment (JACEI) that cites evidence of ongoing violations by Nestlé and documents how the FTSE4Good strategy led to Nestlé weakening its formula advertising policy. “JACEI acknowledges the continuing concern with regard to some aspects of Nestlé’s interpretation of the International Code, the implementation of company guidelines and the transparency of the procedures for monitoring compliance. These concerns may cause some through conscience to maintain a consumer boycott of Nestlé products.” [emphasis added]. We explained to JACEI and CFB that it was not necessary to invest in Nestlé to “engage” with executives – we have been in communication with the most senior management of Nestlé for decades. We also warned that it would be misrepresented by Nestlé. It began immediately and the current comments on Nestlé’s website show it continues to exploit the CFB decision despite past assurances that it would not do so. “one delegate representing both the Methodist Church (which had had an engagement and policy change process, and the URC, which was commencing one), noted that, in his view the Methodist change in policy had been used by the company and misrepresented them. Could Nestlé provide assurances that any decision the URC makes will not be similarly misused? “Niels Christiansen gave assurances that it is not in the company’s interest to misrepresent the views of investors or to capitalise on a policy shift. If that had happened, it was regrettable and would be looked into. Nestlé is keen to inform the URC process with the facts as part of a constructive engagement process, but would not seek to promote any decision in the company’s own public relations interests.” [emphasis added]. As Nestlé’s actions then and since demonstrate, no organisation can take assurances from Nestlé’s most senior executives on trust. While they may sound reasonable and comforting, Nestlé is engaged in a public relations offensive so that it can continue to put profits before the rights of mothers and babies. We have again raised this with the Chair of the JACEI committee in a recent letter. Executives will say whatever they believe people want to hear to persuade them. They will then break their word, leaving Baby Milk Action hard pressed to correct the false impression given. Nestlé’s Chairman, Peter Brabeck-Letmathé, treats FTSE’s requests with contempt – he again misrepresents inclusion in FTSE4Good in an interview in The Guardian published 31 January 2014. “Brabeck also defended Nestlé against accusations by Baby Milk Action that it contributes to the unnecessary death and suffering of infants around the world by aggressively marketing baby foods. Should we be surprised that Mr Brabeck does not tell the truth about FTSE4Good when he manages to sleep at night pursuing policies that put company profits before the lives of babies? He knows that babies who are fed on formula are more likely to become sick than breastfed babies, but continues to defend promoting formula with the claim it “protects” babies and using other strategies that systematically violate the Code and Resolutions. We have a proven track record in forcing changes, but it is not easy and we need your help.